Canada should view and present itself as one startup ecosystem rather than separate hubs like Toronto and Waterloo, Wattpad CEO Allen Lau said Monday as Startup Canada’s national tour wrapped up in Toronto. Following Lau’s keynote address at the event, an audience member asked him what can be done to accelerate Canada’s startup scene. Reflecting on the size and concentration of startup funding, talent and experience south of the border in Silicon Valley, Lau said it would make more sense to treat Canada as a single entity rather than as a collection of smaller, separate markets in various cities. “Canada is a very large country so we’re seeing a lot of different ecosystems popping up. We have to do it more holistically. We can’t view Toronto and Waterloo differently,” said Lau, who founded Toronto-based Wattpad in 2006. The social network for authors and readers now has 40 million users worldwide. 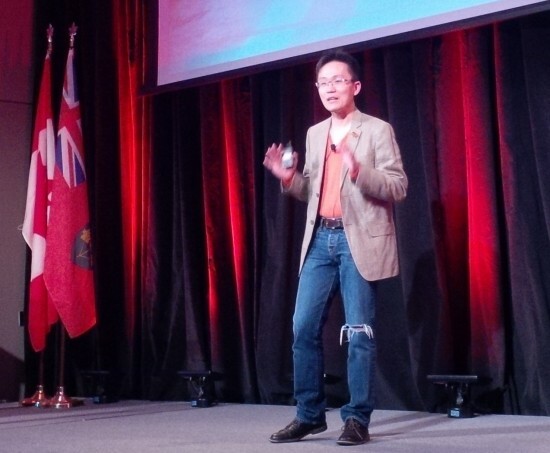 Wattpad founder and CEO Allen Lau at Startup Canada’s national tour stop in Toronto. “There’s only one Silicon Valley. So stop treating (Canada) as silos. Treat us as one holistic ecosystem,” Lau said. In a July report released by Compass (formerly Startup Genome), Vancouver, Toronto and Waterloo all slid down in the global rankings of startup centres, with Silicon Valley again taking the top spot. “Growth in Canadian startup ecosystems has slowed relative to the rest of the world,” the report concluded. At Monday’s event, Lau also urged Canadian startups to look at government as more than just a source of financing. Although Lau didn’t mention the election that ousted Stephen Harper’s Conservatives, Monday’s event was attended by Bardish Chagger, the newly elected federal minister of small business and tourism. Chagger didn’t make any funding or policy announcements during her speech there. 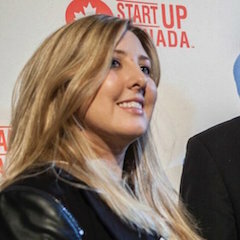 But Startup Canada co-founder and CEO Victoria Lennox said her chat with Chagger at the event gave her a sense that the new government will take “a really open and collaborative approach” to startup support. Startup Canada co-founder and CEO Victoria Lennox. “I haven’t seen an indication with this government (of) what their strategy or policy is going to be with entrepreneurship and small businesses beyond tax reduction, which they’ve committed to, and advanced funding for accelerators and incubators” as set out in the Liberal campaign platform, Lennox said. Information gathered from Startup Canada’s cross-country tour will be formulated into a proposed national entrepreneurship strategy and presented to Chagger in early 2016. The Toronto event was the last in the tour, which also stopped in Halifax, Montreal, Vancouver, Whitehorse, Calgary and Ottawa. Lennox announced Monday that Peel Region and Sarnia-Lambton have joined the official network of Startup Canada communities, bringing the total to 24. In addition, Startup Canada said it will help provide entrepreneurs with access to co-working facilities in seven Ontario cities. Launched in 2012, Startup Canada is a non-profit organization offering funding, mentorship, work space and other resources to Canadian entrepreneurs.